As some of my fellow readers, friends, and subscribers know, I am in fact pregnant! My husband and I are expecting in the Spring, and what a wonderful blessing it is already. I am an avid holistic approach kind of person. I would rather try something safe that has been used for thousands of years, than something that was chemically concocted. Yes, I do believe conventional medicine does have a time and a place to be used. With being pregnant, I have become even more cautious of what goes into my body. My husband and I use organic coconut oil for a variety of different things (lotion, cooking oil, mouthwash/oil pulling, dry end hair conditioner, ect). It is so versatile, plus it keeps and lasts quite awhile. 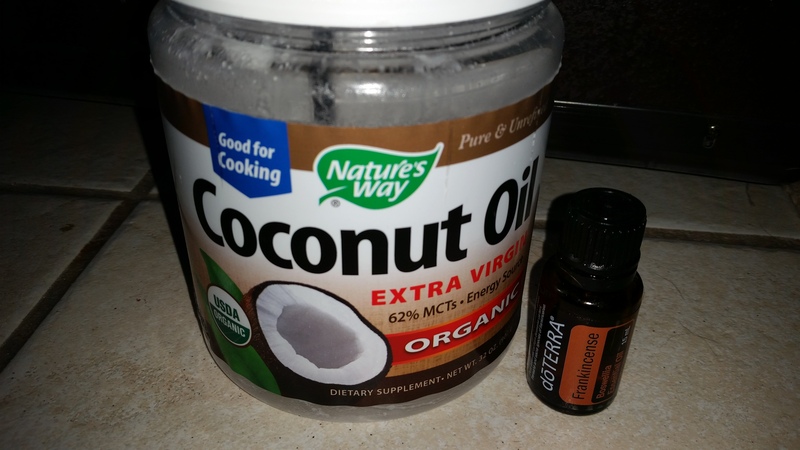 With my previous experience with coconut oil; I have come to find a great remedy that seems to be working for stretch marks during pregnancy. I use about a teaspoon of coconut oil along with one drop of Frankincense oil. The research I have done shows Frankincense to be completely safe to use during pregnancy, please do not take my word for it, research it for your own peace of mind. If you are unfamiliar with essential oils, I suggest checking out this website. It is a great tool, and will be helpful!